Books with Grey Hair | Indestructible Ideas! There is an allure to old books — the cloud of smoke that mushrooms up after you pat the dust off; the used pages worn down by time and cobwebs; the stains of fingerprints and coffee give you a story of previous users. 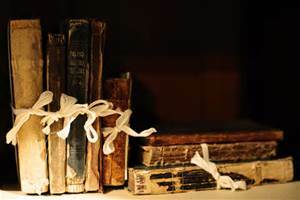 Each book has its own scent that tells you what it’s been through. Out of print books, especially, have a magic to them — like their author, they have died too. It’s our duty to keep these words alive. Rummaging through the boxes outside of old bookstores, looking through the dirty shelves of poor thrift stores to find these unwanted masterpieces adds to their enchantment. Books are more than ink, paper, and glue bound together. May they transport you to another era, force you to question your own existence, or plunge you into philosophical despair. Whatever it is, may you feel as your eyes seduce the words. May you deny invitations because you can’t put your book down. May you stay up late with your book while a faint light shines down only at the pages you’re reading — so you don’t wake the others. May you wet the pages with tears and with spit from your laughter. Feel the words. Feel, because so many of us don’t anymore. Find an author who makes you uncomfortable, the one who tells you the truth. Kill the author who sugarcoats life for you, the one who gives you Disney expectations. Life is so much more than is portrayed on our Instagram posts, or our Facebook feeds. Uncover the writer who gives you what’s under the mask; the one who depicts the sordid and dark themes of ordinary life. Find the sleazy writer who gives you degenerate paragraphs. It is these authors that will make you feel. They shatter the mirror on your face to the color of blood, to the cracks in your bones, all until you finally know who you really are.